I really enjoy the process of making prophetic art, because it can take many twists and turns and surprises along the way. Typically, I will have a word, a colour, a shape, or a person to start with. On this particular day, I only had the desire to paint. And then a request for a painting came in. I don’t think I have EVER painted on a request before, and I said so, but I also said, “I will pray about it.” Little did I know that the desire to paint was right in front of me. Within a few minutes a song began to roll off my lips, and the painting poured out with more passion that I could ever imagine was possible…what a gift! As we moved into our new home and began to settle in over a year ago, we began to get to “know” the house. I still recall the first time I viewed the house. It was overwhelming. I won’t go into unnecessary detail, but it was difficult to envision it being mine, and I was convinced that, even though it was propped on the edge of the mountain, there was “no view.” The truth was, I simply hadn’t found it yet. We renovated before we moved in, changing key elements to provide a sort of “blank canvas” feel. We were starting to unwrap the mystery behind the move. As we began to move in, unpack, and explore, I began to find even more things about the house that I didn’t realize were a part of the equation before. The ironing board hidden inside a drawer. The boiling water tap in the kitchen. Surprise. Joy. And then something even deeper happened. The more we settled in, the more we became aware of something else. It will seem silly to you. But to me, it is symbolic. 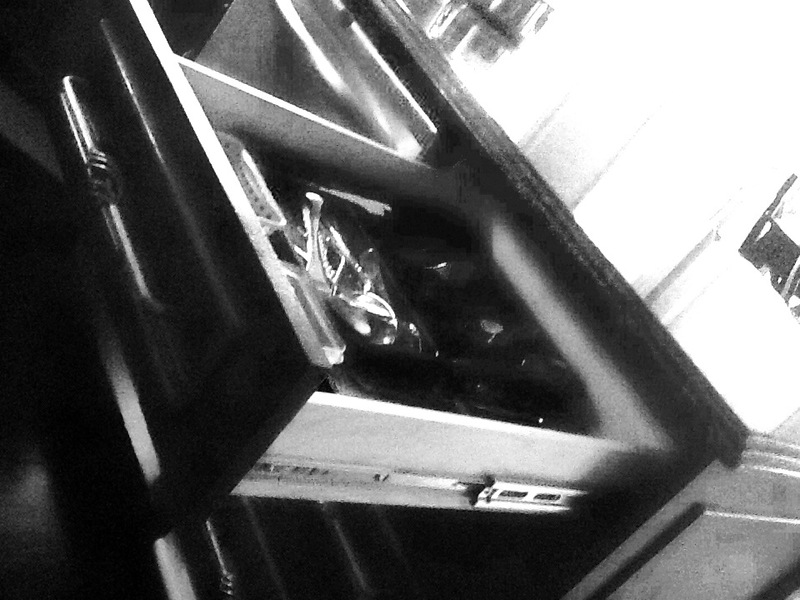 You see, there is something weird about the cutlery drawer. If it is not pushed solidly shut (and no one can actually explain how “solidly” and how “shut” we mean when we say this), it will open at random times during the day. Sometimes it opens right after the attempted close. Other times it opens when I am in prayer. Or just sitting in quiet contemplation. And then slowly the drawer slides open like an invitation to me that whatever it is that I am doing right then is important. And deeper than I think. And more meaningful than I currently know. The drawer becomes an invitation to the table. I could say that I love my house, but now I know that it never really was about the house, and it isn’t even about a slippery drawer. As the snow falls in gigantic flakes all around me, the drawer having slide open moments before, my soul just waits, invited, to see and take a part of the present. Where I am. Where God is. If I had my way I would have purchased the crazy expensive gigantic fork and spoon I found at one of the furniture stores last year. But now I realize that what I have is even better. Out of curiosity, my husband asked me why I was “announcing” that I paint for FREE. “Why make a big deal out of it?” he said. Others may agree that I now have a classic case of “losing your crown in heaven” because of all the praise I will be receiving from people now that I’ve said it out loud. How very unhumble of me. Well, I’d like to explain my process, so that you can understand why I had to do it. Because it most certainly wasn’t always this way. Those who have known me for years would say they never even knew I was an artist or could paint. I hid it quietly. In fact, I felt like that was the right thing to do. That is, until just recently. The change, I believe is the result of maturity, humility and character. Gasp. Ack. There she goes again. Now she’s really crossing the line. I know, right? Who says these things of themselves? Well, I guess I’m finally realizing that it’s okay to look at who I am through God’s eyes. And finally, I can see me. I’d like to propose that what seemed so humble before was actually just hiding in, around, and behind my gift. Basically, I buried it. I was safe from criticism and responsibility that way, or so I thought. But let’s just saying it like it is. And it’s time for me to step out and invest. What am I investing in? Well, I like to think that if you are reading this, I am investing in YOU. No longer am I holding my passion in until I have “arrived” and become approved. I’m actually there right now. I’ve never been more there…I just “get it” now. I want you to see what I’m doing and be challenged. Be inspired. Ask yourself what you are doing with your resources. Just try it. Look at yourself through God’s eyes again. Ask Him who you are to Him. You might just be surprised at what He says. You don’t have to DO things to please Him. He loves you for who you ARE. Personally, that incredibly good news makes me want to DO THINGS to please HIM…becuase it makes me so incredibly happy. If you want to be priceless, all you have to do is believe that you already are. Now…what are you going to do about it?